In March, 1058, Lulach mac Gillecomgan, the young King of Scots, perished in battle against Malcolm Canmore at Essie in Moray. The location indicates Malcolm’s aggression in coming north; one of the annals states “do marbad...per dolum,” or slain with treachery. Later sources refer to Lulach as “the Fool” or “the Simple” – epithets perhaps attached during Malcolm Canmore’s reign. At the time of his death, Lulach was about twenty-six years old, and Macbeth had been dead some seven months. Within days of Lulach’s death, Malcolm Canmore was crowned King of Scots. Soon after, he married an Ingebjorg, said to be Norse, perhaps either the widow or daughter of Jarl Thorfin Sigurdsson of Orkney. Possibly she was Lulach’s own queen. Lulach’s son, Maelsnechtan, was relegated to a monastery; Lulach’s daughter, whose name is unknown, married a MacWilliam, and had a daughter named Gruaith or Gruadh. Since naming patterns were common in early Scotland, it is possible that this child was named for her maternal great-grandmother. Little is known of Macbeth’s queen, so that historians have drawn conclusions based on the events and circumstances around her. A set of documents from the Priory of Saint Andrews, charters of land donations between 1040 and 1057, provide her name and lineage: “Machbet filius Finlach...et Gruoch filia Bodhe, Rex et Regina Scottorum.” Her father and therefore her royal line are identified, and she is accorded the title Queen of Scots here, in itself significant: she is full queen beside Macbeth, not consort. While Lady Macbeth appears in one extant eleventh-century document, Macbeth is mentioned in several contemporary documents, mostly entries in annals written by Irish, Scottish, and Saxon monks. He is variously called Mac bethad mac Finlaech, Macbeth, Makbeth, Machbet, possibly even Magbjotr (in the Orkneyinga Saga), and “the king with the outlandish name,” as one contemporary Saxon source refers to him. Spelling was a freeform art early on. Throughout the book, I have done my best to simplify some challenging Celtic and Norse names wherever possible. In addition, for consistency, Scottish Gaelic is used in the text; in eleventh-century Scotland, Irish Gaelic was the norm, though even then it was transforming into the Scots version spoken today. Other languages that Scots would have encountered regularly in their own land included Latin, Norse variants, and Saxon English. Most of the major events in the novel are based on historical account, either events that definitely occurred, or could have occurred under the circumstances. Gruadh’s first husband, Gillecomgan of Moray, died in 1032, trapped in a burning tower with fifty men at Burghead Sands. Perhaps the attack was orchestrated by the displaced Moray warlord Macbeth, about age twenty-seven then, acting alone or in cahoots with King Malcolm II, his maternal grandfather. Historians have assumed that Gruadh was probably married at about fifteen years old, placing her birth between 1015 and 1018. Lulach’s birth in late 1032 or early 1033 implies that Gruadh married Macbeth following Gillecomgan’s death, perhaps before the birth. A victor marrying his vanquished foe’s widow was not uncommon in Celtic society; it gave protection for the widow and children, and instant kinship ties discouraged vengeful kinsmen from killing the groom. Macbeth’s marriage to Gruadh was clever and necessary. Her claim to the throne was the best in Scotland, yet her gender prevented her from ruling alone. Not long after their marriage, Bodhe and/or his son or grandson (“Mac mhic Bodhe” says the record, but the interpretation of the Irish differs) were murdered, possibly by order of King Malcolm II. Rather than destroying the line, this strengthened Gruadh’s claim and that of her husband Macbeth, though after old Malcolm’s death in treacherous ambush, Duncan mac Crinan, another of his grandsons, became King of Scots according to primogeniture, a system still foreign to Scotland then. Duncan was a warrior in his prime and something of a loose cannon. He took a foolish risk in going after the Orkney Vikings and Jarl Thorfin Sigurdsson. Even with capable Scottish ships, Duncan’s forces were no match for dragon boats and Norse naval skills, and Jarl Thorfin was rumored by his contemporaries to possess magical knowledge; his description as dark, craggy, and tall in the Orkneyinga Saga is a common description given a wizard. Only a fool would have attacked that sea-dragon repeatedly, enduring defeats and more than one salt water dunking, and Duncan came back for more. When he turned south to march on the Saxons, resulting in a horrifying defeat, his actions caught Scotland between two ferocious enemies. Scotland’s warlords, including Macbeth, may have seen no choice but to stop their king. Sources agree that Macbeth acted as a general for his cousin Duncan, and apocryphal tradition says that Duncan attempted to poison Macbeth, which is adapted in the novel. Medieval pharmacopaeia included the herb rue (ruta graveolens, common rue, herb-of-grace), which was used as an antidote to poisons and herbal overdoses. It seemed fitting to produce that in the nick of time to save a warlord who must have survived all manner of dangers to reach the throne. Macbeth and Duncan met in combat on Moray soil, whether it was battle or skirmish, in August, 1040. Sources say Duncan was gravely wounded by Macbeth and taken to a nearby smithy at Pitgaveny–smiths were often the surgeons of their day–so it seemed logical that their fight would be hand-to-hand, and that Duncan would be surrounded in the smithy by a handful of comrades, including Macbeth and his warriors. Gruadh could easily have been there too, given the proximity of the field and the smithy to Elgin, Moray’s main seat. From a tiny bit of evidence, what can be surmised about Gruadh inghean Bodhe is fascinating. As a teenage girl in a warrior society, she was married to a great warlord, destined to become a queen if the men around her succeeded in their ambitions; raised in a proud Celtic tradition that respected women’s rights, she would have been tough, independent, and accorded some equality among males. Warrior women were common in Celtic myth and early society, and eleventh-century Scotland was more Dark Ages in some of its aspects than medieval. In fact, Scotland did not become truly “medieval” until Malcolm’s queen, Margaret of England, influenced her adopted country with more European ways. In Macbeth’s time, Scotland was still insular, provincial, and very Celtic. Gruadh would have been no stranger to weaponry and warrior practices, and only the tenets of the Church–which still met resistance in the stubborn Celtic nature–would have prevented her from fighting. She was a very young Lady of Moray and Queen of Scots, at first a teenager coping with enormous life issues, yet emotionally and physiologically still a developing girl. She became queen in her early twenties, and was near forty at the time of Macbeth’s death. She was still alive in 1049 at the time of the land donations to the monastery at Loch Leven recorded in the Saint Andrews register, and likely alive in 1050 when Macbeth went on pilgrimage to Rome–the only medieval Scottish king to do so–where he reportedly scattered silver coins like seed, a magnanimous gesture on behalf of his small, fierce, proud country. Perhaps he wanted to curry Papal favor, and perhaps he had personal sins to expunge–he may have killed two first cousins, Gillecomgan and Duncan, for the sake of his ambition, and for Scotland’s sake. That Macbeth and Gruadh never had heirs of their own may have given the king a need for a religious pilgrimage to have his sins forgiven. The question of Macbeth’s children remains sadly unanswered; Gruadh had birthed one healthy child, at least. Some genealogies record a son, Fearchar, and another son born in the decade of the 1040s, but they apparently did not survive. A local tradition holds that “the sons of Macbeth” are buried near Kincardine O’Neil. Macbeth appears to have given Lulach, his stepson and the son of his cousin and enemy, his blessing as heir to Moray; quite possibly, in a final act, he fostered Lulach’s own kingship. Most striking and intriguing are the unspoken, unrecorded hints regarding Gruadh’s marriage and relationship with Macbeth. The marriage was likely forced upon a young girl caught in brutal, tragic circumstances, yet the relationship seems to have been stable and respectful, at the least. Until the end of his life in August, 1057, and over twenty-five years of a possibly childless marriage, Macbeth never set Gruadh aside in favor of a more fertile woman, as was often done when an heir was not produced. The mere fact that Macbeth left Scotland in 1050 for perhaps weeks or months indicates that Scotland was in capable and trusted hands. Gruadh would have acted as regent, with young Lulach and Macbeth’s own war council supporting her. This suggests an atmosphere of peace and trust, not only in Scotland, but between Macbeth and his queen. The idea of heading Malcolm Canmore off at a watery pass was my own, based on the possibilities. Relative peace with the Vikings existed by then, and with Earl Siward of Northumberland and Crinan of Atholl defeated and deceased just after Macbeth became king, the only real threat was from young Malcolm Canmore and the Saxons who harbored and backed him. Malcolm’s later foray into Scotland to claim his deceased father’s throne was to end any halcyon years in Macbeth’s Scotland. As for the seventeen years of Macbeth and Gruadh’s reign, Scotland was described by an eleventh-century poet as “brimful east and west” with peace and prosperity. Macbeth’s death as depicted in the story differs from the longstanding historical record, which held that Macbeth and Malcolm Canmore met and clashed at least twice, first in 1054, when Macbeth forfeited part of Lowland Scotland to Canmore, and retreated into Moray’s mountain fastnesses, and again in August, 1057--when Malcolm is said to have slain the king at Lumphanan, near Kincardine O’Neil. Some accounts hold that Malcolm beheaded his longtime foe there to become rightful king himself. This discounts, above all, that Lulach reigned for seven short months. The eleventh-century manuscript known as “The Prophecy of Berchán” gives a physical description of Macbeth, a rare gem in the historical record for any medieval king: “the tall, red, golden-haired one, he will be pleasant,” it says of Macbeth. This long praise poem, written in Old Irish, is a chronicle disguised as prophecy: the verses were composed and written by more than one bard, cleric, and/or poet, each taking turns chronicling the Scottish kings while maintaining the “conceit” of a prophetic voice. Possibly the eleventh-century bard-scribe knew Macbeth personally, as the brief, intriguing reference to Macbeth’s death implies an insider’s knowledge of Macbeth’s last day. Perhaps the bard was part of the king’s household. The Berchán poet says of Mac bethad mac Findlaech: “...in the middle of Scone he will spew blood on the evening of a night after a duel.” The theory that Malcolm killed Macbeth at Lumphanan (an older name, Lannfinnan, is used in the novel) is set a bit on its ear by this, and fascinating questions arise. If the poet is correct, Malcolm severely wounded Macbeth, though Macbeth survived long enough to get away and travel fifty-five miles south to Scone, dying within a day. What motivated this great and dangerous effort? Benjamin Hudson, the translator of the Berchán poem and author of Prophecy of Berchán: Irish and Scottish High-Kings of the Early Middle Ages (Greenwood Press, 1996), suggests that Macbeth’s motivation lay not only in his pride as high-king of Scotland, but in the drive to do what was best for Scotland, while protecting his family. In part, the wounded, dying Macbeth strived to reach Scone so that Lulach could be rightfully crowned King of Scots on the Stone of Destiny itself, the stone being the kingmaker. The right as crowners was held by the MacDuffs, as is known in later medieval history, such as the famous incident of the crowning of Robert Bruce by Isabella of Buchan; I merely assigned the first privilege to Gruadh. Macbeth’s further drive must have been to protect Queen Gruadh. Once he was gone–and he must have known he was dying–Gruadh would have been hunted by Malcolm Canmore, perhaps murdered for the value of the blood that had once placed her on the throne. Perhaps Macbeth knew that Canmore would have forced his vanquished foe’s widow to marry him, as Macbeth had once done himself. The only way to keep her safe was to place her son on the throne as her king and protector. This also suggests that Macbeth felt sure that Lulach and Gruadh would have the backing of the warlords of Scotland. As his last act, Macbeth placed the welfare of Scotland, and the protection of each other, in the hands of his wife and stepson. Scots were laid to rest. Given Malcolm Canmore’s vengeful nature, the existence of those graves is a remarkable testament to the loyalty of Macbeth’s close followers. 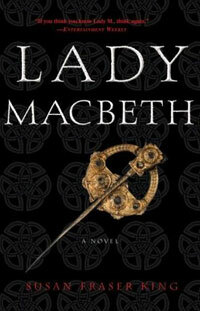 The historical tale of Lady Macbeth and Macbeth, based on scholarly evidence, is a far cry from Shakespeare’s wildly brilliant play, written in part as propaganda to please King James I of England, VI of Scotland—taking an earlier king and queen of Scots down a peg or three must have seemed a good idea at the time. Shakespeare’s main characters were conjured from sheer dramatic genius, rather than strict history, to become iconic dramatic creations. So it seems appropriate to let Shakespeare have the last word: “For brave Macbeth–well he deserves that name...” (Act I, scene 1).